I’d like to talk some more about the protagonist of my mini-series, Sheldon Gillis. Sheldon Gillis is 14 years old and lives in the town of Flatlands in North Dakota. He was born to Marianne Gillis, who gave birth to him while still in high school. For many years, Sheldon has been bullied for unknown reasons. Sheldon always tried to fight back, but was physically overpowered. Things change though when his uncle Jack (Marianne’s older brother) returns after a 15-year trip to Japan, bringing back him with knowledge of the Japanese martial art of aikijutsu. From here on, Sheldon undergoes training to learn this style, the unarmed fighting style of the samurai. As you can see in the above picture, Sheldon wears a gi of red and black tied with a white belt during his training. Most of his training involves practicing the techniques with his uncle, but also physical conditioning. Sheldon evolved quite a bit. When I originally conceived his personality, he was quite reckless and impulsive. 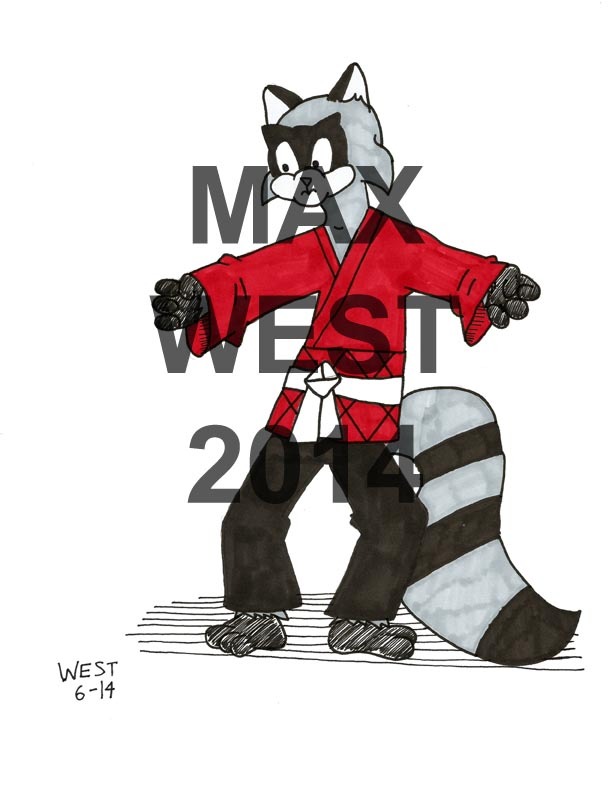 This original personality was based on Bert Raccoon from the 1980s TV show, the Raccoons. However, this clashed during the writing of the scripts. I wanted Sheldon to be targeted for no reason at all; someone always talking and acting recklessly would definitely attract the wrong attention. So I changed him into something more like the movie characters played by Bruce Lee. So what does that mean? Sheldon is not someone who goes looking for trouble. I wanted his opponents to be the instigators; they are the ones who start the fights and basically Sheldon ends up fighting when he has no other choice. I’ll have a page or two up in the next few days of Sheldon’s adventures. During my last days in North Carolina, I began to conceive another idea. The rubric I’ve given this idea is “Sheldon the Mighty”. Years ago, while in college, I wrote an unpublished novel about a rock band similar to Buckaroo Banzai and the Hong Kong Cavaliers. They were entirely made up of anthropomorphic animals and one of them was a keyboardist from Toronto, Canada. His name was Sheldon Gillis. The novel was never published but I did like the character and did at least one short story with him. During my time in North Carolina, I started watching an anime series called Kenichi the Mightiest Disciple. The series involved a bullied high school student learning martial arts to stop and drop the bullies always attacking him. I liked the concept and began to combine that with fighting video games and side-scrolling beat-em-ups to come up with the concept of Sheldon the Mighty. The backstory is about our hero, Sheldon Gillis. Sheldon is an anthropomorphic raccoon of 14 years who has recently started high school. He lives with his mother in the fictional town of Flatlands in the US state of North Dakota. Sheldon has been bullied all of his life. Why? We don’t know. Maybe it was because he was born out of wedlock (Sheldon’s mother got pregnant with him while she was still in high school). Some say others were jealous of his academic skills. Some say he wasn’t part of the in-crowd. It’s deliberately left unclear as to why Sheldon is being bullied. The important thing is that he just is. Things change one day when Sheldon’s uncle returns to North Dakota after spending the last fifteen years in Japan. Upon learning of Sheldon’s constant problems, this cool uncle starts to teach Sheldon the Japanese martial art of aikijutsu. Sounds a bit predictable? Well, things get interesting after Sheldon initially stops the bullies. His problems don’t end; they’re just beginning. All these trained fighters who had otherwise ignored Sheldon before suddenly take notice of his skills…and want to see how good he is in a fight. This is planned as a mini-series. I have notes for twelve stories as well as a few completed scripts. In the coming weeks, I plan to share some art and pages from this series. Most of these stories concentrate on Sheldon fighting a particular opponent and using his guile to win. Each individual story name in the series shares a title with a song of the 1980s. For example, the two part pilot story is titled “Take On Me” after the song of the same name by A-Ha. I’ll have some more information and maybe some artwork next time.